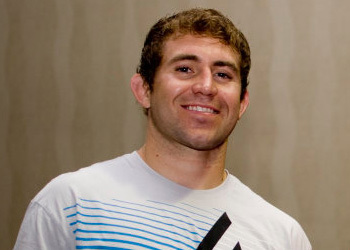 Clearly, posting a win over Michael Bisping and having bragging rights over the chatty middleweight isn’t good enough for Alan Belcher (Pictured). After hearing Bisping promise it wouldn’t take him more than five minutes to finish Belcher off when they battle at UFC 159, “The Talent” upped the ante by presenting the Brit with an unusual bet. “You can take me out in round one?” Belcher asked. “I’ve never even been knocked down in my career. I don’t think so. If you can take me out in round one, I will get the British flag tattooed on my chest. I’ll get the British flag with your face on it on my chest. Both 185-pounders will be looking to bounce back from disappointing defeats on April 27th. Bisping lost his shot at challenging champion Anderson Silva for his crown when he ate Vitor Belfort’s shin. Belcher saw his four-fight winning streak evaporate in the wind by the hands of Yushin Okami. The 28-year-old was dominated in a unanimous decision loss at UFC 155. UFC 159 takes place inside Prudential Center in Newark, New Jersey.